Declutter and repeat. Start by going through drawers, cupboards and closets and arrange items using boxes, baskets, containers and bins. Not only does this create a tidy space, but it makes it easier to find items. Next, either shred old papers that have been piling up or organize them using file folders. A colour-coded filing system works best — think green for your finances, blue for anything house related and orange for personal files. Lastly, hide cords using ties, boxes or hooks to instantly create a clear space. Use the walls. 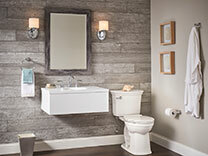 Think of all the various items that can double as décor and storage that go up on walls in your main living spaces. Purchase a coat rack to ensure coats aren’t tossed over the banister anymore, put up floating shelves to store books and various knick-knacks, and install hanging canvas bins to store toys or scarves and toques. In closets and laundry rooms, add shoe racks and a variety of hooks to hang anything from keys and umbrellas to mops and brooms. Give your items some second-hand love. This time of year, we’re usually shuffling all things summer into storage. But before you pack up last season, take time to sort through clothes, furniture and décor. Make a keep, donate and recycle pile to maximize storage space and eliminate clutter. But don’t stop there — go through other items that can be recycled, such as used batteries that pile up because you’re not quite sure what to do with them. Used batteries can be recycled to reclaim materials that can be used to make new items like golf clubs and silverware. Call2Recycle has more than 8,000 drop-off locations across the country, so one is bound to be close by. Find one nearest to you online at call2recycle.ca. Now that you’ve pulled out your lawn furniture, uncovered the barbecue and put on your flip flops, you’re eager to enjoy some fun in the sun. But if you’ve recently moved into a new home, don’t forget it still needs love and attention beyond just cutting the lawn once in a while. Even with today’s energy-efficient, high-tech homes, seasonal maintenance is important because it helps protect your new home warranty. By failing to regularly maintain your home, you risk causing damage that may not be covered by your warranty. Find more seasonal maintenance tips online at tarion.com. Get a jump on your spring-cleaning with some tips that’ll leave every corner in your home spotless in no time. Make it part of your routine. If you wait to clean and tidy up once a week, a month or even a season, you’re setting yourself up for a long, heavy chore that you’ll only dread and procrastinate. Instead, try incorporating easy tasks like wiping the kitchen counters, straightening out the living room and freshening up your bed with linen spray into your daily schedule and you’ll have a much easier and quicker time of it when you deep clean. Choose appliances that tackle the dirty work. You may already have a self-cleaning oven or laundry machine, but that self-cleaning magic is more valuable than ever when you can have it in the bathroom. The new VorMax Plus self-cleaning toilet from American Standard is a huge time-saver that cleans and freshens your toilet every time you flush. Available at Home Depot, it features an innovative design that uses a Lysol fresh infuser that reduces dirt buildup and an antimicrobial surface that inhibits the growth of stain- and odour-causing bacteria. Set tidying up on autopilot. It’s a lot easier to clean when you have a system that keeps your house clean. Keep your mud room area in top shape by encouraging everyone to sort their coats, shoes and mitts as soon as they set foot in the door with designated hangers and pretty storage boxes. Eliminate unattractive packaging and clutter in the bathroom and kitchen with mason jars and decorative canisters for your toiletries and dried goods. Have items work double duty. Get creative and think outside the box to find things that can do some of the cleaning for you. For example, your dishwasher can do much more than just clean your plates, pots and pans. Load it up with plastic toys, light fixtures and toothbrush holders and have it run while you work on everything else. Using dryer sheets to prevent musty odours in clothing storage boxes, linen closets and shoes means you won’t have to do extra cleaning or laundry just to get rid of unwanted smells. Add some inspiration. Sometimes tasks feel like they take forever simply because they’re dull and repetitive. Time flies by when you’re entertained, so listen to a podcast or stream re-runs of your favourite show in the background for cleaning that seems speedier. You can also use the time more efficiently by multitasking and squeezing in a workout while you clean. Make every step count with a fitness tracker and throw in a few exercises like pushups or squats every time you switch rooms and easily meet your daily physical activity goals. 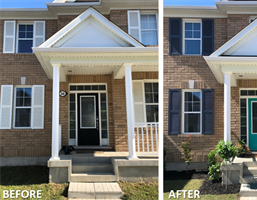 As warm weather approaches, spring is the perfect season to assess whether your home is in tip-top shape after a long winter. Below are four home maintenance tips every homeowner should consider to help keep insurance claims at bay while increasing the value of your home. Get those gutters clean. With warmer weather and a greater likelihood of flash rain storms, now is the time to make sure your eavestroughs are clean. 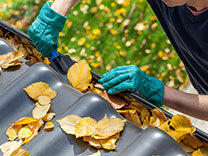 Removing any debris like leaves and dirt will prevent gutter backup and reduce leaks when it rains. Keep the roof over your head. Roof damage — including loose shingles, leaks and cracks — is common during the winter due to the heavy weight added by snow and ice and icicle formation. 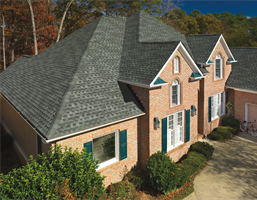 As winter melts away, inspect your roof and attic to determine if any repairs are required. Check the drainage of your property. Receding snow and ice may unveil eroded landscapes or pond-sized puddles on your property. Take advantage of the changing season to ensure your property is fitted with appropriate drainage fixes. This may be as simple as extending your downspout to drain into the lowest area of your yard. Make sure you’re covered. Now is a good time to look at your home insurance plan and make sure your coverage is adequate. Summer weather events, social gatherings and time away can make your home more susceptible to damage or break-ins. You can easily manage your policy online with companies such as Esurance, freeing more time to enjoy all that summer has to offer.